Matthew Guy sand Scott Photo from SBS" Morrison on the hustings during failed Election campaaign. 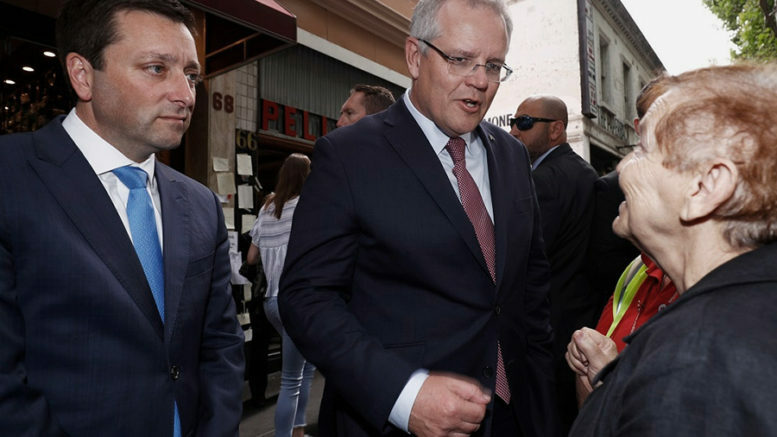 The Liberal Party’s disaster at last weekend’s election in Victoria, is behind a new wave of internal bloodletting, and the first shot was fired when Malcolm Turnbull’s own radical dominated local branch voted to expel him. 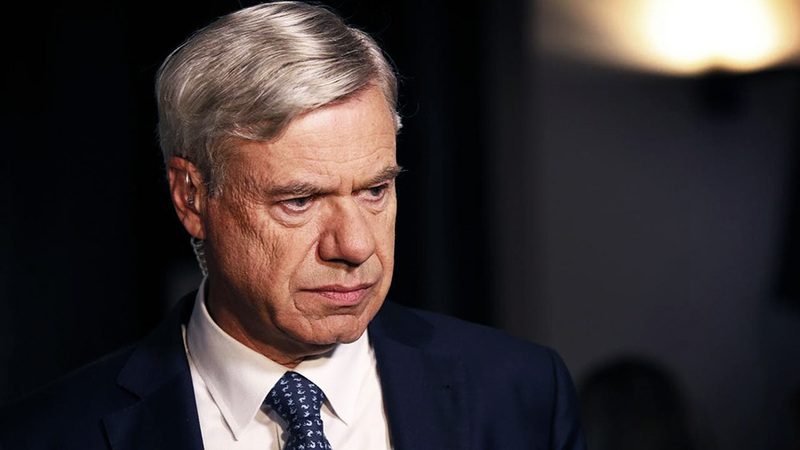 Apparently, there is a group working for the resignation of the party’s president Michael Kroger and State Director Nick Demiris, both of who are linked to the opposing faction, which is fighting back. On Monday, Senator Scott Ryan called for a return to a more moderate politics on Radio National. 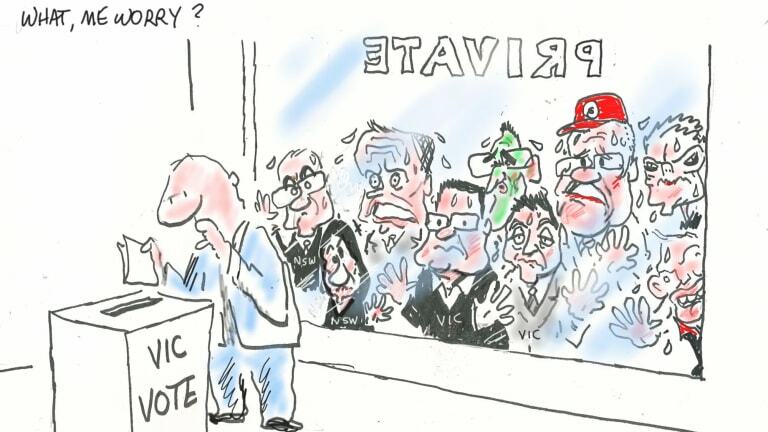 The election result has given the New South Wales branch, which is not particularly popular itself, an incentive to quickly distance itself from the Victorian and Federal sections of the party, in order to convince to voters that they are different, before they have to go the polls in March. But this has not stopped the internal punch ups. On one side, some senior figures in NSW and elsewhere have censured the Victorians for “demonising” and “targeting” particular migrant groups. They have also criticised the African crime gang campaign, and the promise to shut down the new safe injecting room in Richmond. Although the criticism focused on Victoria, there is an implied criticism of the Federal party, which has largely gone down the same road. Some have even attacked the influence of the Murdoch aligned media. Others beg to differ. They blame the lack of a clear enough political message for the Victorian disaster. Among them are those who have been driving the new direction. One of them is Federal Treasurer Josh Frydenberg. Prime Minister. For them, this is not about retreating, but about rejigging the strategy to continue pushing the same political agenda. Scott Morrison is s far keeping his head low. But he was directly is identified with the politics of hate that were central to the Victorian campaign and soundly rejected. The problem to him and those who share his political views is that there is a need to become more sophisticated and have a clearer focus in pursuing the same goals. Bolt blames what he called the Liberal “left” for the Victorian route, because they get in the way of those who want to go in the opposite direction. The implications are that the “left” is holding the party back and that this needs to be dealt with. He takes a tilt at Scott Morrison. No that this is new. But according to Bolt, the election result is further proof that he has got to go. Morrison is said to lack the needed decisiveness and determination to push forward. Bolt is clear in his belief that the Federal election next year will be lost, and the party needs to be rebuilt, more strongly, along firmer lines advocated by him, his employer and his favoured “right” faction. 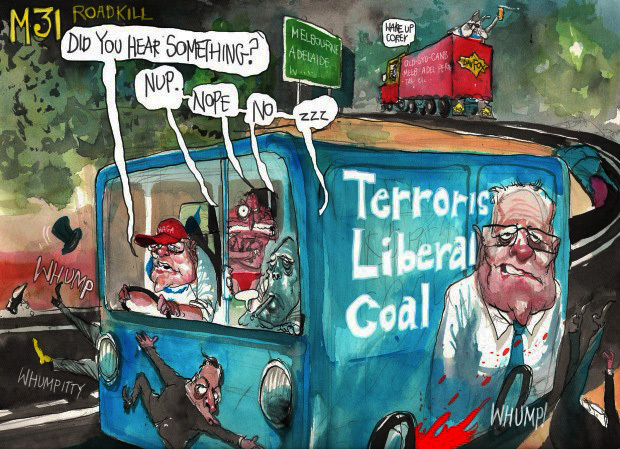 Be the first to comment on "The new wave of Liberal Party bloodletting has begun"